An award-winning fiction writer and teacher shares hard-won advice. Novelist and memoirist Scofield (Creative Writing/Pine Manor Coll. ; Swim: Stories of the Sixties, 2017, etc.) brings her experience as a writer and teacher to a practical, encouraging manual focused on revision. Although addressing novices as well as advanced writers, the author assumes that her audience is fairly sophisticated and well-read: she includes examples from canonical fiction (The Scarlet Letter, The Great Gatsby, Madame Bovary) as well as lesser-known works, such as Maisie Dobbs’ Leaving Everything Most Loved and Rebecca Rasmussen’s Evergreen. 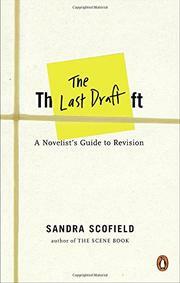 Often, Scofield reflects on the challenges of writing and revision that she faces in her own work. She distinguishes between revising a first draft and rewriting, which is a process of “total immersion.” She advises working from two printed copies of the draft—“a real object with weight and a smell, a size and a color”—along with pens and index cards in several colors, which come in handy for several exercises, including creating a storyboard, an illustrative analysis of a novel’s chapters and scenes as they unfold. “Be very wary of cut-and-paste,” she cautions; retyping, even if only a few words have been changed, “will help you to maintain coherence and flow.” Scofield also suggests keeping a revision journal to record questions, reflections, and self-evaluation; as revision progresses, she suggests writing “a document that describes your love of your story.” The book is filled with exercises that focus intensely on reading as well as writing. These include making a stack of admired novels “to identify qualities you might aspire to,” writing taglines for a recently read novel, and choosing six “noncontiguous” scenes from the manuscript under revision to assess how they connect across the plot. Appendices offer a list of recommended books on craft, lessons from model novels, and examples of scenarios, storyboarding, and scene templates. Patience and commitment, this useful guide reveals, are a writer’s strongest assets.